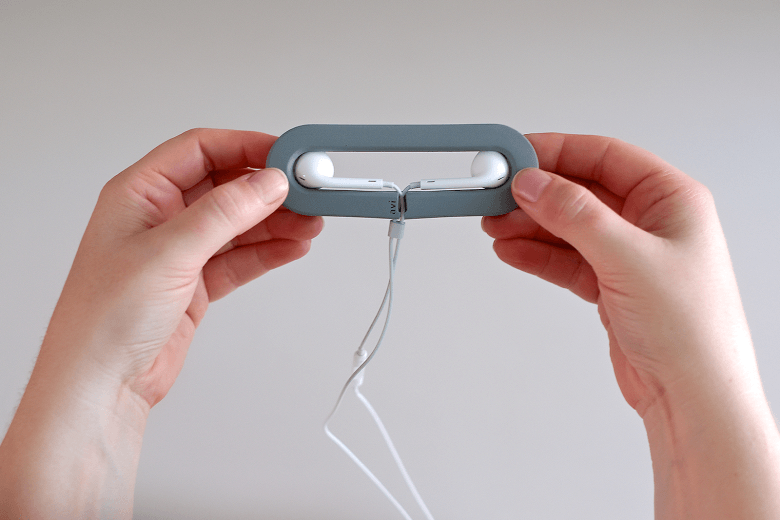 Smart-Spools are possibly the most effectively designed solution for keeping your headphones and cables organized. This post is brought to you by Avi, maker of Smart-Spools. “Cable organizers” is one of those useful product categories that no one can quite seem to get right. The engineering problem seems simple enough: Give me a way to neatly wrap up and stow my peripherals, like earbuds and power cables, ideally in a form that’s compact and not overly complicated to use. Many have tried, but too often — whether due to improper sizing or an emphasis on form over function — cable organizers end up being less convenient than simply wrapping your headphones around a few fingers and stuffing them in your pocket. Smart-Spools finally got it right, though. Designer Matthew Kennedy, working for Canadian accessories upstart Avi, approached the problem from first principles, engineering the simplest, most effective and most sensible design for a cable organizer we’ve ever seen. Smart-Spools may be the last word in avoiding cable chaos, but right now you can only get one by contributing to Avi’s Kickstarter campaign, which launched yesterday. Maybe the most notable thing about the three inaugural Smart-Spool models (there are several more in the works) is how simple and effective they are at keeping your cables tangle-free. Made of soft, durable silicone — and available in gray, charcoal, blue, yellow and pink — there are no frills. Smart-Spools are compact, durable tools that are surprising in how logically and directly they solve a common challenge we all face. The Spin’s design is very intentional, ensuring that the spooling surface of the organizer’s outer ring remains round while keeping a large enough diameter to prevent the cable from kinking. 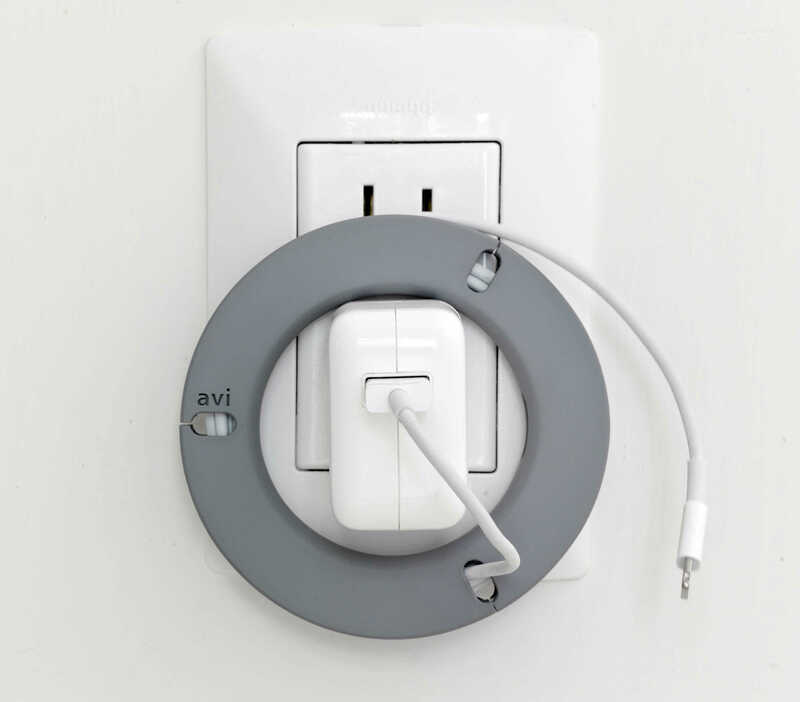 The Lightning connector snaps into a special notch in the Spin, allowing the cable to spool over it without creating a lump. The oblong Echo Smart-Spool, on the other hand, is designed to embrace earbuds, and works with numerous models (but prefers Apple’s EarPods). The Echo’s central channel snugly holds the earbuds themselves and allows the cord to spool around, with the flat portion of the spool acting as a “landing pad” for the EarPods’ hard plastic mic/volume switch. The design is impeccable, and elegant in its simplicity. The Smart-Spool Spin for iPad keeps your charger and cable beautifully organized. This isn’t just clever design for its own sake, either. Proper spooling of the cables results in longer life and prevents fray. Due to their simplicity, Smart-Spools cable organizers forego a number of common features found in competing products that are meant to be convenient but actually wear down cables and hardware faster. Having products like Smart-Spools on hand is low-impact, saves time and extends the life of your most essential and vulnerable electronics. What’s not to support about that? Head to Avi’s Kickstarter page to help bring these products to market, and put a Smart-Spool or two in your pocket. The Kickstarter campaign runs through April 5, meaning there’s only 33 days to raise $33,000 to launch the product line.